So you’ve finally decided to visit Peru and cross Machu Picchu off your bucket list. Before you rush off to the famous picturesque mountaintop citadel, be sure to spend some time exploring the city of Cusco, the former historic capital of the Inca empire. There are many options to get to Cusco. Dozens of direct flights leave daily from Lima’s Jorge Chavez International Airport with ticket prices for the 90-minute flight starting at about $80. Long-distance buses are another great way to travel to the ancient city but don’t necessarily cost that much less. One of the safest and most reliable companies, Cruz del Sur (www.cruzdelsur.pe), leaves regularly from Lima. Prices for the 21-hour journey start at $60. For those that have time to visit a few other places along the way, Peru Hop (www.peruhop.com) offers several bus trip itineraries. You can choose from several three and four-day packages that include such popular stops as Huancayo, Ica, and Arequipa along the way. For the ultimate train trip, you can book the Belmond Andean Explorer (www.perurail.com/trains/belmond-andean-explorer) from Arequipa to Cusco. This two-night trip includes luxury accommodation, onboard meals and beverages, entertainment, and several excursions along the way. 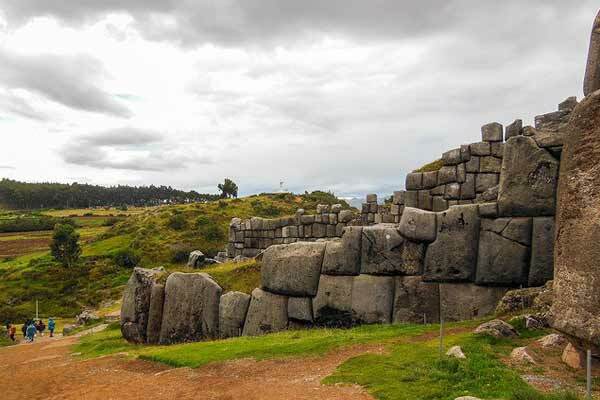 The Boleto Turistico is a pass that allows access to 16 ruins, museums, and other sites in the Cusco region. The full ticket is about $46 and is valid for 10 days. Less expensive partial tickets cover fewer sites and are valid for one or two days. They are all available at the entrance of most sites or at the COSITUC office in Cusco (www.cosituc.gob.pe). Cusco’s high altitude and fairly close proximity to the equator combine to make for an interesting climate. If you headed north from the equator for the same distance, you would end up in tropical El Salvador or Honduras. 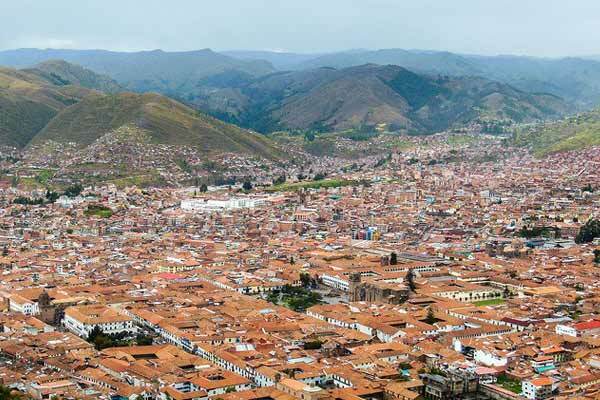 But Cusco’s altitude of over 11,000 feet results in a year-round mixture of warm days and cool nights. The best time to visit for the most sunshine and least amount of rain is from May to October. Rains don’t really begin in a big way until November. Taxis – There is never a problem finding a taxi in Peru and Cusco is no exception. Despite the stories circulating about the dangers of taxis in Peru, I have never had a problem. Although they are unregulated for the most part, i have found most cab drivers to be friendly and helpful. They don’t have meters, so it is important that you agree on a price before you get into the car. Buses – These are less expensive than taxis but can be crowded and nerve-racking. When you need to get off just yell “Baja” several times until the driver stops and lets you off. And keep an eye on your valuables because crowded buses are prime areas for pickpockets, especially during busy times in peak seasons. Combis and Collectivos – These are large shared vans and the cheapest way to get around the city and to neighboring towns in the Sacred Valley. You can travel for a couple of hours for only a few dollars. There are no set schedules for the most part and they leave when they are completely full. They can be crowded but this is the best way to experience the local flavor. Large items of luggage get thrown on the rooftop, sometimes including live animals stuffed into potato sacks. They are the least expensive way to get around the city and to travel to neighboring towns such as Pisac, Chinchero, and Urubamba. 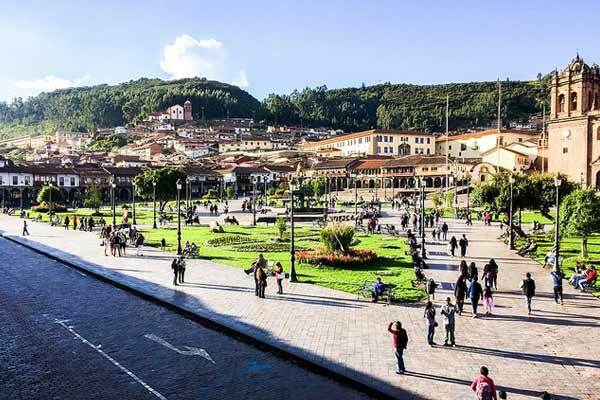 Any trip to Cusco will probably begin in the Plaza de Armas, the hub of the historic part of the city. The striking 16th century cathedral is a great landmark to begin your exploration of the city and the surrounding area. Disregard the numerous vendors around the square who will attempt to empty your wallet for everything from a shoeshine to a bus trip to nearby brothels. Just be forewarned that any quoted prices will probably be much less than you will end up paying when all is said and done. Spend time exploring the traditional old neighborhood of San Blas where you will find narrow and steep streets, colonial houses built on Inca stone foundations and numerous art galleries, shops, restaurants, and pubs. Start at the southeast corner of the main Plaza and walk past the magnificent Cusco Cathedral up Calle Triunfo. This soon changes to Calle Hatunrumiyoc, one of the best-preserved original Inca roads in Cusco. Here you can view the famous 12-Angled Stone that is part of the impressive wall that was once part of Palacio Inka Roc’a. At the top of the hill, Plaza San Blas is a great starting point to explore the narrow streets of the neighborhood and all its charms. You don’t need to spend a fortune to enjoy a three-course meal in Peru and Cusco is no exception. Only minutes away from the hectic tourist center you will find a plethora of local restaurants offering great dishes for low prices. Feast on such favorites as Lomo Saltado, Cuy al Horno, Rocoto Relleno, and Aji de Gallina along with a jug of Chicha Morada, a non-alcoholic drink made from purple corn. And don’t forget to enjoy a Pisco Sour, made with Peru’s most famous alcoholic beverage…Pisco. The unofficial national soda of Peru is Inca Kola, a bright yellow drink with a flavor somewhere between bubble gum and cream soda. If Machu Picchu is the King of Inca ruins, then Saksaywaman is the Queen. This impressive fortress covers acres of hills on the outskirts of the city. It is a steep 40-minute hike up to the entrance from the Plaza de Armas but a 10 soles ($3) taxi ride will only take you a few minutes. This huge complex is a great showpiece of typical Inca architecture using huge polished stones that are fit perfectly together. You can even ride down a centuries-old polished rock slide. Only a short walk from the Plaza de Armas, this is Cusco’s traditional open-air market. You’ll find freshly made juices, breads, fruits, veggies, grains, nuts, cheeses, fish, and all kinds of meats along with a smattering of tourist trinkets. Don’t be afraid to bargain. But this is probably not the best place to purchase high-quality alpaca textiles…you will be better off in one of the shops in town. Head to Machu Picchu the night before so you can relax for an evening and spend some time exploring the small town of Aguas Calientes. My favorite dining spot is the colorful Indio Feliz restaurant located in the center of town. Here you will be treated to a good variety of Peruvian and French dishes in a pleasant setting set back a bit from the touristy main street. It’s also fun to people watch from one of the many restaurants overlooking the main square. The Sacred Valley of the Incas stretches for 60 miles along the Urubamba River from Machu Picchu to Pisac. Take part in a day tour or spend some time in one of the many ancient villages in the valley. 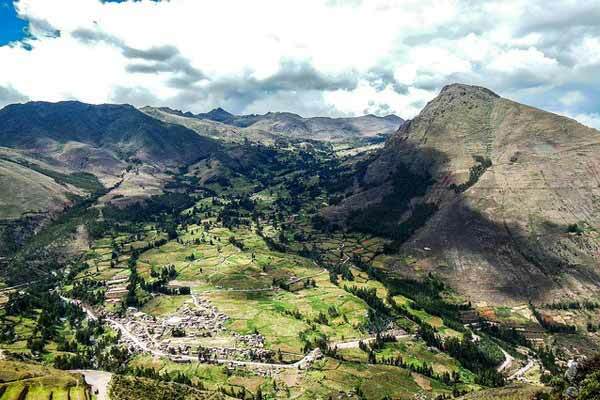 Dotted with Inca ruins, interesting hiking trails, outdoor markets, wonderful crafts, and a haven for alternative food and medicine, the Sacred Valley is a great place to explore history as well as yourself. For the heart of traditional textiles, visit the small town of Chinchero. The traditional salt mines of Maras and the ancient terraces of Moray should also not be missed. You can book tours from Cusco or take a cheap “combi” to the main turnoff where you can hire an inexpensive driver for a couple of hours to tour both sites. Just past the small town of Pisac, the Parque de la Papa awaits. This hidden gem is run by a group of six Andean villages, growing and harvesting more than a thousand varieties of pure-bred potatoes using techniques and breeds that date back to ancient Inca times. As you take in the rolling hills, soaring mountains, and ancient terraces, you will get a taste of what Peru was like when the Incas roamed the land. A park restaurant provides visitors with home-cooked meals prepared by the villagers and authentic crafts and textiles are available for purchase. Day tours can be booked from Cusco (www.parquedelapapa.org).